In this humorous and heartfelt debut about a split cultural identity, nothing goes according to plan for sixth-grader Lucy Wu. Lucy Wu, aspiring basketball star and interior designer, is on the verge of having the best year of her life. She's ready to rule the school as a sixth grader and take over the bedroom she has always shared with her sister. In an instant, though, her plans are shattered when she finds out that Yi Po, her beloved grandmother's sister, is coming to visit for several months -- and is staying in Lucy's room. Lucy's vision of a perfect year begins to crumble, and in its place come an unwelcome roommate, foiled birthday plans, and Chinese school with the awful Talent Chang. This is an interesting topic, and a theme that is also being explored in recent Australian children’s fiction. The book explores what it feels like to be an American born Chinese girl. Lucy is American, she loves basketball and would rather eat lasagne than authentic Chinese food. She’s looking forward to her sister going away to college because it means she finally gets her own room…but nothing goes to plan. 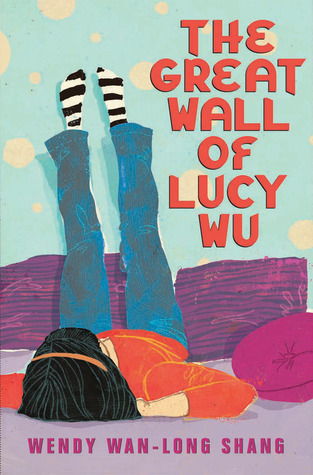 Her Great Aunt, Yi Po comes to stay and Lucy has to share a room, not happy, she builds a wall of bookcases and dressers to keep Yi Po out. When her parents tell her she has to give up basketball to go to Chinese school (on a Saturday), Lucy has had enough. If this isn't enough to deal with Lucy also had to deal with Sloane, a girl at school whose bullying is making life difficult for Lucy. I did find myself becoming frustrated with Lucy, but I think that’s the point, she became quite obnoxious in her stubbornness, but as the story progressed, Lucy began to gain some perspective, and to me she became more likeable again.